The village of Lopez is built at the junction of the Loyalsock and Lopez Creeks. It was named Lopez after the tributary that flows into the Loyalsock Creek from the Southwest. There are several versions regarding the origin of the name Lopez. One version is that about 1816 the Susquehanna and Tioga Turnpike was being built from Lake Ganoga to the Loyalsock Creek at Seemans, and thence to the place where the village of Mildred is now located. A man by the name of Lopez went with the road builders and furnished board and lodging to the men employed in building the Turnpike. He erected crude camps built of logs at different places as the work progressed. Since one of those camps was built on the bank of the unnamed creek about five miles above its junction with the Loyalsock Creek, it is said that the stream was called the Lopez Creek after the man conducting the camp on its bank. Or the current story is that during the construction of the Turnpike, a man by the name of John Lopez was killed by a falling tree; and the stream was named after him in commemoration of the accident. The present site of Lopez was, at one time, a vast wilderness, and game and fish were plentiful. There was a roomy cabin built of logs and covered with hemlock bark some little distance above the confluence of the two creeks near the old H. M. Kellogg residence. This was the goal of innumerable hunters and fishermen in search of game and formed a stopping place, both going to and coming from their hunting and fishing trips. The first house in Lopez was built by Reily Steinbach. who had the contract to peel the bark from the trees west of the Lopez Creek and on the flat south of the Loyalsock Creek. This house was located where John and Joann McDonald now live. The settlement did not grow for a number of years and merited its name Tar Bridge. But when the Lehigh Valley extended its line from Bernice to Lopez in 1886, the name it bore at that time did not appeal to the growing town; and when a post office was established in 1887, the name given was Lopez. In May of the same year, J. S. Hoffa of Dushore built a sawmill with which there was a small store erected back of McGee’s Hotel. The mill was sold to C. J. Willhelm who operated it for several years. In later days the store was owned by Mrs. Shymansky. D. W. Osier of Forksville, realizing that a booming town would soon be built at this point, erected a hotel in the winter of 1886-87. He sold it to Deegan and Farrell. Other proprietors have been Tony Rouse, Paul Daly, Walter Yarosh, Pete Stavisky, and lastly, Mrs. Vera Gulich until it burned in the tragic fire on April 30, 1982. In 1888 Trexler and Turrell purchased a large tract of timber on the Lopez and Painter Den Creeks and built a large sawmill on the outskirts of town. Soon houses to accommodate the workers and their families were constructed. A large company store was erected, and the village of Turrelltown was established. Large splash dams were built across the Lopez Creek, and logs were floated to the mill. By 1897 the timber had all been cut from their tract of land, and Trexler and Turrell sold their mill to Jennings Brothers who converted it to a hardwood mill. Turrelltown still exists as an attractive community. Families purchased the homes, and over the years they have modernized them. The store building was bought by Mr. and Mrs. Martin Kwaitkowski who converted it to a dwelling house. It was destroyed by fire a number of years ago. In 1888 the Jennings Brothers, who were operating a sawmill on Taylor Creek near Seeman’s Hotel (what was the old Kachmarsky farm) moved their mill to Lopez. The Jenning’s Mill was located along the Loyalsock. To provide housing, forty homes were built along the Pigeon Creek Road and along the side hill north of the Loyalsock. They also built a large general store on the bluff overlooking the stream. Worth and Cortez Jennings built homes on either side of the store. Today Joe & Tina Tabor live in the only original home on that side of the creek. In order to provide work for the women of the community and to utilize the slab wood from the mills, a Kindling wood factory came into being. The first one was erected in 1888 by McCartney and Hall. It was located along the Thorndale Branch of the railroad on the flat near the Papke home. It was burned down in 1890 and was rebuilt the same year. Later it was sold to the Standard Kindling Wood Company of New York City who sent their product to the large hotels there. In 1895 the Fisher Kindling Wood factory was built on the flat below Walshes and six months later was destroyed by fire. It was rebuilt in 1896, and it again burned down during the same year . Sixty days afterward the factory was rebuilt and in operation. It was again visited by fire in 1897, and the packing room burned. The damage was soon repaired. When the Lopez Mills ran out of timber and closed in 1905, the kindling wood factory continued to operate using wood from Trexler and Turrell at Ricketts until it was destroyed by fire in March, 1907. At that time it was the only industry still operating in Lopez. In 1894 J. W. McCartney built a clothes pin factory near the Jennings Hardwood Mill. Eventually it was sold to the Jennings Brothers who operated it until their lumbering operation was transferred to Maryland. By 1890 Lopez had become a lumbering center with a population of over a thousand people. To meet the needs of the citizens, a number of business places were established. In addition to the large general company store of the Jennings Brothers, Clark Brothers built a general store near the location of the old Chesonis building. Henry Castle and C. A. Johnson were the proprietors of prosperous general stores. Wes Johnson erected the old post office building and operated a store there. It later burned in the fire of 1982. There were three restaurants. John H. Yonkin erected the building that recently housed Catherine’s Gift Shop and had a restaurant there. William E. Steafather was the proprietor of a restaurant in the building that used to be the John Decker home. Reed Frutchey operated a saloon and restaurant in 1904 – 05, and then he sold it to James P. McGee who converted it to the McGee Hotel. Jacob Per of Hughesville opened a branch-clothing store. H. M. Kellogg was the proprietor of a well-stocked jewelry store; and in partnership with Dr. J. L. Christian, he operated a drug store. Harry Brewer had a draying business at the old George Adams house. A. L. Dyer conducted a meat market and also a livery stable. D. W. Pealer had a combination shoe repair and harness shop and residence where the Andy Decker family now lives. There were three barbershops owned by W. L. Johnson, Lawrence Dunn, and L. R. Carrington. The Barber Shop of W. L. Johnson, in which later Becky Johnson sold post and greeting cards, this once housed the McGuire Studio and Hobby-Photo Shop now gone in the fire of 1982. A wholesale liquor store was run by J. P. Gorgg. Dave and Marty Brown erected a large hotel building which, in recent times, was the Chesonios store, Grid Iron and lastly Dougher’s Inn. The chief attraction back then was several bears in pens. They sold to Henry McDermott who in turn sold the building to H. W. McKibbins. Lopez was the only lumbering community in the area which allowed liquor to be sold; therefore, on pay day “woodhicks” from Ricketts and other nearby communities came to spend their hard earned money as quickly as they could drink it away. There were four hotels: The Lopez House with James P. McGee, proprietor; the McKibbins House, H. w. McKibbins, proprietor; the McDermott House, Henry McDermott, proprietor; and the Jackson Hotel, Mrs. Julia Jackson, proprietor. Jim McGee had the largest hotel in town, and he did a thriving business. Woodsmen coming into town would give him their money, and McGee would keep track of it until it had all been spent at his bar. Then the woodhick would sober up and return to the woods to work several months before he could save enough to repeat the process. There were four churches that conducted regular religious services in the town. In the year 1890 a group of Protestant fold gathered in the schoolhouse for instruction in the Scriptures. This group wished to be recognized as a regularly organized body, so they set a meeting time for congregational organization. After the Annual Conference had made its examination, the body was formally recognized as the Lopez United Evangelical Church. Worship services were conducted in the school from 1890 until 1896 when a congregational meeting was called for the purpose of providing a church building. Jennings Brothers donated lumber, and a church building was erected that same year. It was dedicated by the Pastor, the Reverend I. E. Spangler . The Methodists erected an edifice on Main Street in 1888. The Lutherans were permitted to hold their services in the Methodist Church with the pastor coming from Ricketts every Sunday. A Roman Catholic Church, commonly known as St. Mary’s Chapel, was located over Mrs. Mary Collin’s Store. It was a Mission Church of the Mildred parish, and was served by the same priest, Father J. A. Enright. The Chapel was dedicated in 1911. The building was subsequently donated to the Scranton Diocese by Mrs. Paul A. Daly . With the exodus of the lumber interest in the summer of 1905, many of the people engaged in lumbering followed the Jennings Company to Maryland. Consequently the population of Lopez was reduced about one-half. In 1902 the Murray Brothers came from Scranton and opened a mine which bore their name, and the development of the surrounding coalfields brought a return to prosperity. The breaker which the Murrays erected was one hundred sixty -five feet high, taller than any other in the anthracite field . When the mine was ready for full production, many miners and their families moved in to the village and began acquiring property and building homes. The young women of the miners’ families provided a source of labor, and the Mason Silk Mill was erected near the site of Jenning’s Hardwood Mill along the Turrelltown Road to give them employment. Charles Obert of Dushore was the superintendent of the mill for a number of years until the silk industry declined all over the country, and it was closed. A building boom was on once more, and Albert Dyer opened a building supply and hardware store. Building contractors were the Steafather Brothers, John Gavlick, and Fred Leyfert. During the days when the coal industry was at its height, there were quite a number of stores in the village. On the Main Street, J. J. Martin was the proprietor of a men’s clothing store. Sam, the Turk, sold imported fabrics in a shop which would be operated in the Shymansky Building at the rear of McGee’s Hotel. Wolf Sachs and his family lived in the old V.F.W. Hall and operated a general clothing store. There was also a millinery store with Lizzie Kernan as the milliner. The town had two barber shops with Lawrence Dunn and Will Johnson the proprietors. Johnson Brothers Store and the Company Store with Charles McCarthy, proprietor, provided the citizenry with groceries and general merchandise. There were two shoe repair shops operated by Dan Pealer and Dan Filler: Mike Sulick and Sam Yarosh were the Proprietors of modern meat markets. There were three hotels with bars. They were McGee’s Hotel, Rouse’s Hotel, and Chesonis’s Hotel. Several saloons came into being and Steve Hallabuk bought John Yonkin’s Restaurant and converted it. Eventually he built a new saloon near the Walshe’s home and sold the former one to Fred Leyfert. William Steafather’s restaurant became a saloon, and some of the proprietors were Sam Yarosh, William Urban, and John Decker. In the days when the automobile was just coming into its own, Arthur L. Seeman built a garage and repair shop across Route 487 from the school grounds on the present Centennial Park. As for recreation there were two ice cream parlors, each with a pool room in the rear. The proprietors were C. E. Donlon and Fred Leyfert. Lopez also boasted of the first moving picture theater in Sullivan County. The Teitelbaum Brothers erected it next to their wholesale liquor store. There were performances there three times a week with admission ten cents for adults and five cents for children. Since the films shown were silent ones, Elsie Leyfert, Merle and Dorothy Johnson, and Dorothy Seeley were hired to play appropriate music on the piano. The health of the community was not neglected. Dr. J. L. Christian, a very fine physician, practiced medicine there. The dental needs of the residents were taken care of by Dr. Lewis White. When he died, as the result of burns sustained when a kerosene lamp exploded, Dr. M. B. Warburton came to take over the office. In the winter of 1918-19 an epidemic of Spanish Influenza, which was sweeping the country reached Lopez. Whole families became ill which meant that there was no one to nurse them, provide food, or keep fires going to heat their homes. Dr. J. L. Christian realized that it would be necessary to provide a center to care for the many influenza patients. He contacted the Red Cross, and they rushed in beds and supplies. An emergency hospital with two hundred beds was set up in Rouse’s Hall. Dr. M. B. Warburton, the dentist, and nurses Sadie Cangley and Anna Finan assisted in caring for the patients. Townsfolk who were able assisted in pre- paring food, doing laundry, and other necessary tasks. Because of the expert care given to the patients at the hospital, the death rate was low. During the years a number of enterprises were started. Many of them were of short duration. One of the firsts of these was a stone quarry, which was operated for a couple of years. A fine yellow sandstone was obtained from the ledges back of Church Street. The huge blocks were cut and hauled to the railroad station on heavy wagons pulled by six horses. The blocks were shipped to Scranton where they were used to erect a church. The cost of transportation was prohibitive, therefore the project was abandoned. In 1911, the Stony Brook Lumber Company was formed. A sawmill was erected on the site of Jenning’s Mill on the Loyalsock. In order to reach the timber in Crane Swamp on Dutch Mountain about ten miles of railroad was laid on Jennings old roadbed. The work of constructing the line was done by forty Italians under the supervision of William Keiter of Bloomsburg. The men were housed in the former Jenning’s Store building at Shady Nook. In 1916 the lumbering operation was over, and the mill was torn down. In the early twenties Joseph Smith came from Mt. Carmel and purchased the Mason Silk Mill He converted it into the Weldon Pajama Factory. For many years it provided employment for the local people as well as for those from other communities. Another industry, which flourished for a few years, was a brick plant, which was erected near the pajama factory. The clay used in making the bricks was obtained from the Daddow Estate on Dutch Mountain. The Highway Building in Towanda was constructed of bricks from this plant. When the President of the Company died, there was no other member capable of carrying on the business. The remains of the kiln are still standing. A company from Pittston acquired the pajama factory and opened the Sullivan Woodcraft Company. They employed a number of local men. Their specialty was custom furniture. After a couple of years of operation, the structure was destroyed by fire. Although it was a thriving business, it was not rebuilt. There were changes in the churches of the area, too. With the moving of families as the lumbering days came to an end; the Methodist Church was closed. In 1907 the building was sold to the Russian Orthodox denomination. The following year, 1908, the Greek Catholic Church was built by the Steafather Brothers and was dedicated the same year by Father Nicholas Chopey who served as the parish priest for many years. In 1911, Mrs. Anthony Rouse gave the second floor of her store building to be used as a place of worship for those of the Roman Catholic Faith. The name St. Mary’s Chapel was given to it. In more recent years there were more changes made in the village. Rouse’s Hotel has had a number of proprietors. Mr. and Mrs. Paul Daly took over the management upon the death of the Rouses. When the Dalys retired, Walter Yarosh took over and ran the hotel until he joined the Army at the beginning of World War Two. Mr. and Mrs. Pete Stavisky became the new proprietors. After a number of years Mr. and Mrs. Stephen Gulich purchased the business, and Mrs. Vera Gulich was the proprietor until the fire of 1982. Somewhere along the way the name was changed to Hotel Lopez. The Chesonis Hotel changed hands. It is known as the Grid Iron with Mr. and Mrs. Robert Reese as the proprietors and then Doughers Inn.. Joseph Hrubenak (Motsko} purchased Leyfert’s Ice Cream Parlor and Pool Room and carried on the business for a number of years. A number of years ago the building housed Catherine’s Gift Shop where one cold find many lovely and unusual items offered for sale. There were three beer gardens, which were operated by Mrs. Hallabuk, John Decker and Andrew Decker. When Charles McCarthy closed the Company Store, Joe Ellis opened a grocery store there with James V. Christini of Mildred as the manager. The business continued for several years. Ernie Fiocca was the proprietor of a barbershop in the Harry Steafather Building at the corner of Main and Church Streets for some time. Mr. and Mrs. Bernard J. Ortlieb of Dushore became the proprietors of Johnson’s Store and operated it for many years until their recent retirement. The building is now gone, victim o the fire of 1982. For many years John Hurray, Jr. (Shoester) conducted a Shoe, Repair Shop in the Sulick Building. Many a game of pitch was played on a wood table near a old potbelly stove. Alex Stavisky established a greenhouse, nursery, and florist shop on Main Street. He supplied flowers and plants to customers from a large area. Some of the old landscape projects still remain in the county. During the years when Lopez was in its hey day, the social life was interesting and varied. Rouse’s Grove was the center of activity in the summertime. Frequent dances were held in the large pavilion. Fred Leyfert showed movies in his building there. On holidays the whole community turned out for picnics. There was even a merry-go-round to entertain the children. In the winter months activities took place in Rouse’s Hall. The opening highlight each year was the Election Day Dinner and Supper which were prepared by the Ladies Aid Society of the Evangelical Church. Over two hundred people would be served. Dances, plays and concerts were presented in the Hall throughout the winter months. At that time Lopez had its own band under the direction of William Bellas. Sulick’s Hall furnished its share of entertainment for it was there that the popular Voelke “Big Balls” were held. Another attraction was basketball. A town team composed of Paul Dyer, Wilbur Johnson, Glen Springer, John Zondory , and Andrew Kozemko earned a reputation for skill in playing the game. They were challenged by teams from as far away as Towanda, Binghamton, Wilkes-Barre, and Scranton; and they were usually the victors. The games were played in Rouse’s Hall until it was condemned. Then they were transferred to Sulick’s Hall. 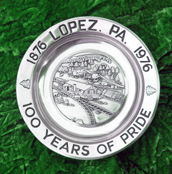 As Lopez passes it’s Centennial, it has become a sleepy little town nestled in the hills of Pennsylvania. It would seem at times, that the village is almost oblivious to what is going on in the outside world; but newcomers are rapidly moving into the area. A number of former residents have returned to the old home town on retirement, and others are planning to take up residence here when their working days are over. It shows that with all their traveling, all their experiences with other people, and all those early, really earnest efforts to shake off all traces of the old home town, they have come to realize that life in a small town is, after all, the best. The History of Lopez was edited from “100 Years of Pride” compiled by the Late Edith B. Shuman and illustrated by Robert McGuire. In the year 2003, five adventurers, Saul, Rudi, Hugo and Maylin, led by Guilmar Lopez, decided to head Northeast of Trenton in search of the mystery as to why a faraway small town surrounded by mountains, 2,445 feet above sea level, and 41″ north latitude 76″ west longitude in the middle of rural Pennsylvania, is named Lopez, like their own last name. Here is their story. Once upon a time on an afternoon in the year 1876, a traveler decided to take a shortcut across the Appalachian Mountains. He was coming from the direction of Mildred, PA, and heading to Wilkes-Barre, PA, with a load of cargo on his horse-drawn carriage. Three miles after he left Mildred he came across an obstacle…..he had to cross a river on what appeared to be a dilapidated bridge. Being a brave man, the traveler did not hesitate to cross over, not knowing at that time that his name would forever be marked in that place. As it turned out, the old bridge collapsed under the weight of the cargo and the traveler, his carriage, cargo and two horses were swept down the turbulent currents of the river to their deaths. Sadly, the only thing that was known about this traveler was his last name “Lopez”. And it was there that the first victim befell a tragic accident that generations later have not forgotten. And so, from these fellow travelers comes to you this little story of a gypsy man, whose tragic fate left his name stamped on this small town forever. Who knows if these five adventurers will return to this town again or if that visit was like a comet that ones sees only once in a lifetime.